★ Do you love cute/funny photos? Now you can add a lots of awesome animal effects/stickers onto photos, and make your friends laugh! ★★ Add multiple effects/stickers onto photo. ★★ Scale, rotate, flip, and re-order the stickers. ★★ Eraser mode - you can use eraser to change the cat/dog stickers to put them behind things - cool! ★★ Load photos from your library, or put stickers in realtime camera! ★★ Can change the opacity of the sticker! ★★ Share your funny/amazing masterpieces on Twitter and Instagram right from the app. ★★★ Want more free stickers? ★ Add eraser mode - you can use eraser to change the cat/dog stickers to put them behind things - cool! ★ Can change the opacity of the sticker! ★ Add one more monkeys package. 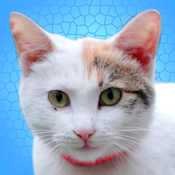 ★ Add more free cats, dogs and other animals. ★ Add more animals to paid packages.